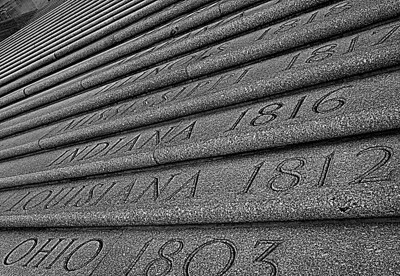 This is the stairs of The Louisiana State Capital . 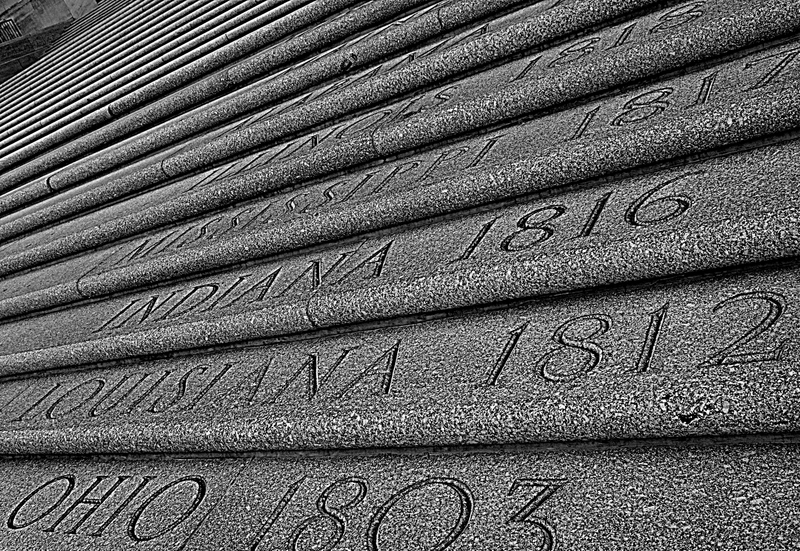 There is one step for each of the 48 states, listed in the order of their admittance to the Union. Alaska and Hawaii were added to the top step when they were made states. The top step is carved with E Pluribus Unum from the Great Seal of the United States; it means "One from Many." I shot this to include Dan's state of Louisiana and my state of Indiana which luckily were right next to one another . It is hard to shoot this due to the height of the stairs. I guess I could have gone with the helicopter option however I feel Louisiana's Homeland Security might have a problem with that ! Submit your B&W art for the challenge . Wow this is one great peace of photo art work and the detail plus light in this photo it stunning..Plus the depth of field in this photo is stunning. What a terrific angle and color tone. Great capture. A great history lesson with subtle lighting and nice textures. Wonderful depth, texture and tones! An excellent shot with very interesting history Marsha. Spend a few minutes each day being grateful for what you have and who you have to share it with. Ohio has been a state since 1803. I just missed going to the celebration by a few years. LOL. Very nice, interesting and educative, too. Beautiful B/W shot. Beautiful view, nice composition. Pretty B/W capture. I like it. Cool find. Made for a great B/W too! I'm in a story both funny and cruel. But am I the hero or am I the fool? Lots of history here and great angle and detail...good one, Marsha. This was beautifully captured, Marsha!